Real Estate is about being organized, and your finances need not only be accurate they need to be audited. An easy way to track your expenses is to dedicate a Credit Card just for your Business Expenses and not to commingle it with your personal expenses. The habit that you must acquire is not just to pay your Credit Card on time, but to audit all your expenses once a month; you have to accept that you will have recurring bills once a month, like MLS Dues, Websites, Marketing Software, etc… but sometimes many of you pay the bill and are not sure why that charge is appearing on your Statement. Some shady vendors count on you being distracted or busy to charge you recurring expenses sometimes months and years after you have stopped using their service. Ask Questions and Audit everything! 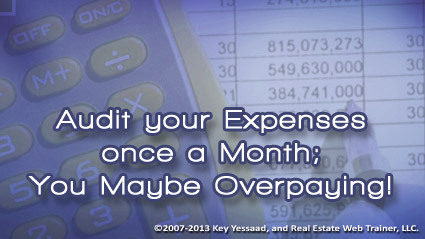 PS: The best time to prepare your expenses and your taxes is at the end of each month!